NEW HOUSE on Lucerne was permitted before an ordinance to curb development took effect in March. 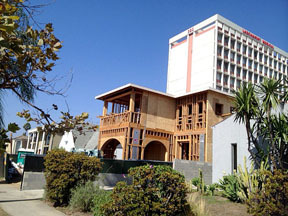 A nearly 4,000-square foot home is being built at 310 N. Lucerne, replacing a single-story Spanish bungalow in Larchmont Village. It’s all above board, as the lot is 7,000-square feet, and under the city’s Baseline Mansionization Ordinance (BMO), you can build about half of the size of the property lot, or, as in this case, 3,500 square feet. “There is an additional 20 percent of BMO incentives… granted if the project is LEED certified or if the project incorporates certain architectural features,” said Tom Rothmann, code studies, City Planning Dept. The mansionization ordinance, passed in 2008, was to prevent McMansions from cropping up throughout the city. But loopholes in the law have allowed developers to build more homes out of scale with the neighborhood. A draft of an updated mansionization ordinance is expected by the end of the year, Rothmann said. 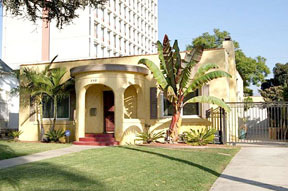 FORMER home on the lot was built in 1921. Seeking relief from the onslaught of large-scale houses on the rise, an Interim Control Ordinance was passed March 25. It limits the scale of new construction in several neighborhoods—including Larchmont Heights (the residential portion of Larchmont Village)—while the manisonization law is being reviewed. Under the ICO, a new home can be 120 percent larger than the one it replaces. The Lucerne home could have been a maximum of only 2,400 square feet as the Spanish bungalow was 2,000 square feet. The applicant had already submitted plans for the two-story home on Lucerne with a 324-square foot carport to the Dept. of Building and Safety for a plan check before the effective date of the ICO. So they were not restricted by the ICO, according to officials at Council District Four office. In the 15 areas protected under the ICO—which also include Miracle Mile and La Brea Hancock—a new single family zoning ordinance is being considered before the ICO expires in March 2017, said Ken Bernstein, manager Office of Historic Resources, city Planning Dept. “Our department will be developing several options for new single-family zones that are meant to be more tailored to existing neighborhood context,” Bernstein said. “The zones will likely vary in how they address scale, massing, setbacks, and bulk… to minimize incompatibility with neighboring homes and enhance the protection of neighborhood character,” he added. Public workshops and hearings will be held before any new zones are selected.